As the demand of fish cultivation will increase, the demand for aquafeed will also increase to fulfill the food requirement for the development of the Aquatic animals. There was an increase of feed-dependent aquaculture which was 53.18 million tons in 2016 and is growing at the rate of 8% annually. The two primary used aquafeed are fishmeal and fish oil, which are made from the remains or byproduct of the fish processing, but a decline in fish meal and fish oil has been observed over a decade. Of the total aquafeed, shrimp feed (21%) and salmon feed (11%) had the largest market share in 2016. Shrimp feed production was highest in India (66%), Thailand (42%) and Indonesia (33%), whereas Salmon production was highest in Norway (94%), Canada (86%) and (85%) Chile. Goldstein Research analyst forecast the aquafeed market size is set to reach USD 73.1 million by 2024, growing at a CAGR of 12.8% over the forecast years. Appreciation in aquaculture, dietary changes leading to shift towards sea food, and demand from animal feed market for protein rich diets such as for pets, are the factors responsible for the development in the aquafeed production. The report covers the present ground scenario and the future growth prospects of the aquafeed market for 2016-2024 along with the import and export data of aquafeed. We calculated the market size and revenue share on the basis of revenue generated from major players and sales of aquafeed from major players across the globe. We have forecasted the market size on the basis of profiles of the key market players and their core competencies while key players in the market have been identified through secondary sources such as the United States Department of Agriculture (USDA) and the Food and Agriculture Organization (FAO), and their market share in respective regions has been determined. On the basis of ingredients, fishmeal has been the main diet, accounting for 5-50% share of the total aquafeed, due to presence of the high amount of protein. But due to limited availability of the fishmeal because of high demand for fish as food, soybeans are being largely accepted for high source of protein and cheaper than the fishmeal. Demand for soybeans has increased in 2016 by 21% and it is expected to be the dominating segment in the near future. 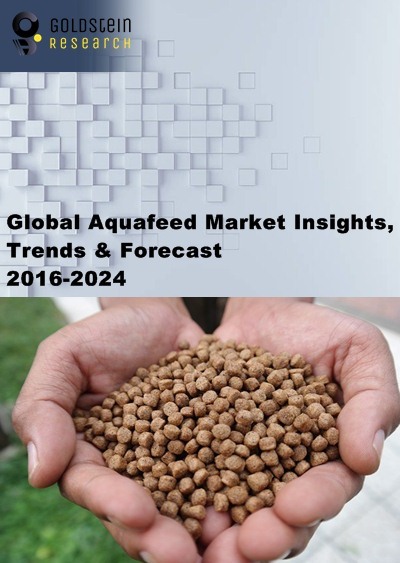 Aquafeed market outlook 2016-2024, has been prepared based on an in-depth market analysis from industry experts. The report covers the competitive landscape and current position of major players in the aquafeed market. The report also includes porter’s five force model, SWOT analysis, company profiling, business strategies of market players and their business models. Global aquafeed market report also recognizes value chain analysis to understand the cost differentiation to provide competitive advantage to the existing and new entry players. Aquafeed production techniques have been changing in order to develop capacity sinking and floating feed machines. The developments in aquafeed extrusion, the computer workstations are able to model the better water stability, better floating property and a higher energy than pelleted diets. According to the report, the demand for farmed fish, which is expected to grow by 50.0% in a decade, is the driving factor for the aquafeed market to grow, in order to sustain the fish harvesting. The global population is expected to reach 9.7 billion by 2050, and to sustain the food security and nutrition, demand for farmed fish will rise, along with the aquafeed quality and quantity. Further, the major challenge for the aquafeed market is the fish-free feed products, such as made of soybean or corns. There will be challenges firstly, to produce high protein and other nutrient rich fish-free feed and secondly, to procure raw material from the agricultural farms for the purpose of making aquafeed apart from the human consumption. Based on geography, Asia-Pacific was the leading producer with 49.7.8% aquafeed market share in 2016. China is the largest producer of global aquafeed market, producing 17.3 million tons followed by Vietnam producing 2.8 million tons in 2016 due to the large consumption of sea food and practicing aquaculture. Europe is the second largest market of the aquafeed with the market share of 32.6% of the global aquafeed production. Europe is the largest producer of salmon feed acquiring 52% market share. What is the revenue of aquafeed market in 2015-16 and what would be the expected demand over the forecasted period?